The Spanish Forger was a skillful and prolific forger, who capitalised on the fashion for collecting medieval panel paintings and illuminated manuscripts, which was widespread in Europe and the United States between the mid-nineteenth and the early twentieth centuries. His distinctive repertory of sweet faced figures set against a background of steep hills and castles derived from the study of illustrated books on the Middle Ages. His work was exposed as that of a forger in the 1930s, on the basis of a panel formerly attributed to the fifteenth century Spanish painter Jorge Inglés. This association provided the name of convenience by which he is still known, although it is generally believed that he was active in Paris in the late 19th century and early 20th century. This is one of a group of five or six miniatures of similar size and borders, painted on the back of cuttings from a text page of an Italian choir book of fifteenth or sixteenth century date. It depicts Jonah and the Whale; a biblical subject taken from the Old Testament, (Jonah 1:17). 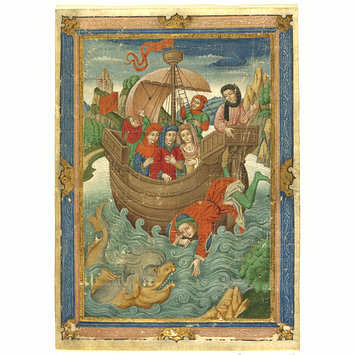 The Spanish Forger has chosen to depict the moment when Jonah is thrown overboard from the ship he was sailing on in to the stormy sea below. The whale can be seen in the bottom left corner, poised to swallow Jonah as he falls from the ship. The figure types and castellated landscape is reminiscent of Franco-Flemish manuscripts from about 1400. However on closer examination of the dress the Spanish Forger has mixed elements of costume from the fourteenth and fifteenth century. This is particularly the case with the men’s headdresses showing its evolving forms from the late fourteenth century hood, worn by the figure to the left of the mast in the boat. This headdress is shown next to the central figure who wears the early fifteenth century development of the hood, which is worn wrapped around a cap. This anachronistic tendency to combine motifs derived from different schools and periods is a principal reason why the works of the Spanish Forger are readily identifiable as fakes. 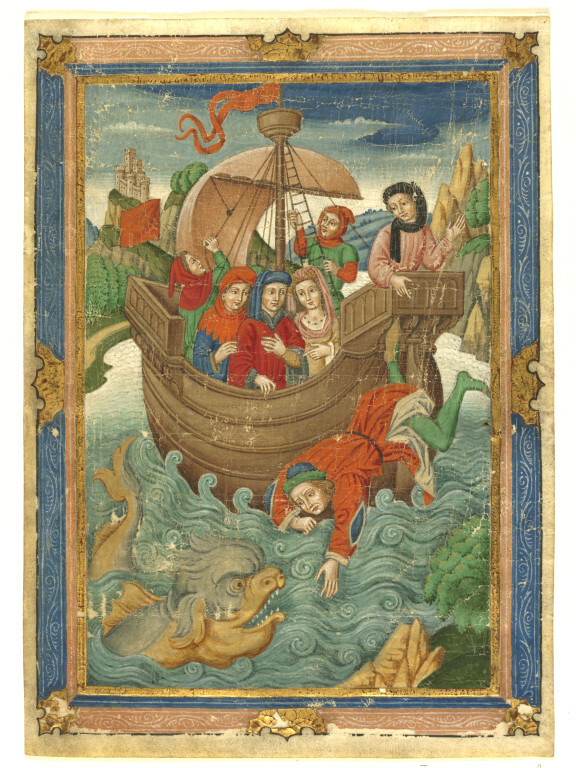 'Jonah and the Whale': illuminated manuscript leaf by 'The Spanish Forger', ca. 1900. Voelkle, William. The Spanish Forger, exhibition catalogue, The Pierpont Morgan Library, New York, 1978. ISBN 875980546, catalogue number L.67, pp.57, plate 186, notes that this is one of a set of five, possibly six manuscripts (catalogue numbers L.65-69 and L.10). MLA Acceptance in Lieu Report 2007/2008, p.20, notes that the manuscript is titled "Susannah and the Elders". L. Burgio, R.J.H. Clark and R.R. Hark.“Spectroscopic investigation of modern pigments on purportedly medieval miniatures by the ‘Spanish Forger’”, in Journal of Raman Spectroscopy, vol 40, pp. 2031-2036, 2009.